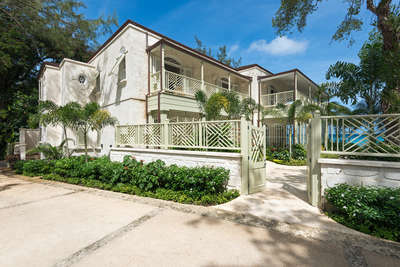 This ultimate vacation villa is set on 11 acres of prime beachfront with direct access to two beautiful white sand bays along the esteemed, palm fringed Platinum Coast of Barbados. Greensleeves, an exclusive vacation villa on a scenic West Coast beachfront headland, has access to two tranquil beaches. Golden bamboo-framed, Mongolian temple doors at the entrance, usher you over a Japanese water garden, brimming with colourful koi. Greenery and tropical flowers, provide an oasis for hummingbirds and whistling frogs. Raised teak walkways and an open-plan design, connect the pond and gardens when moving throughout, with pool and sea views beyond. Eight en suite bedrooms with private terraces, offer guests gorgeous views through carved teak windows and doors, lending rich warmth against cool, white walls. A ninth bedroom, appropriately named ocean suite, is also available on request. Then there is the efficient and warm staff and concierge service, ensuring that your every need is met, from the airport meet-and-greet, to in-house spa treatments and reservation of your activities. Should the adults need some time away from the kids, the spacious two bedroom children's wing, has a jungle gym, a separate kitchen with a lounge and adjoining nanny accommodation. But its Greensleeves' amenities that leave you delighted. The free-form pool, boasts a mini island with coconut trees and swim-up bar. Need a quiet break away from the fun in the sun? Head to the in-house cinema with its high-tech entertainment system; cool and plush, complete with popcorn. Nearby, there is much to enjoy: white beaches, perfect for snorkeling and water sports; a flood-lit tennis court in a large, shady park across the road; pulsating nightlife and duty-free shopping. Excellent dining options range from rustic, beach side cook shops serving local delicacies, to restaurants offering fine international fare. Sumptuous meals at Greensleeves are prepared by a celebrated, private Chef and may be enjoyed in several dining spots, following the Indonesian dinner gong's summons. Blue Point, the second luxury villa on this 11 acre estate, featuring four bedrooms and a separate pool, can be rented separately or together with Greensleeves. Spacious accommodation, in an Asian-inspired setting, is available for 30 guests making this the ideal tropical estate for large families and groups. Please note the ocean suite is only available with nine bedroom rate. High speed ADSL internet access. Laptop, printer and fax machine available. Home theatre and gym are air conditioned. There is a sunfish sailboat, stand up paddle boards and kayaks available for guest use. Staff of 15 is overseen by a full time property manager. 31.5 kilometres to the airport. Three kilometres to Golf Royal Westmoreland.